Church congregations like to hear personal testimonies. I just got back from Heaven. There are many reports by those who have had a close brush with death, and how they found life to be more precious and more worth living from that experience. Has anyone besides me had the experience of appreciating life more than ever after a close brush with Heaven? Now, my Christian friends really want to go and spend eternity there. They live their lives helping others, praying to their heavenly father to grant their desires and those of others. They console, give financial aid to the needy, offer advice and try to be there for others in times of trouble and grief. They're even willing to go so far as to contribute their services in rebuilding houses for others. I must report to them: They'd be useless in Heaven. I do many of these things myself, but my rewards come from doing them without a god reference. I enjoy just doing them. Sometimes I find that I've been successful, and that's what keeps me going. No heavenly reward required. That's about it for my life on Earth. When I arrived in Heaven, it looked ideal: everything clean and neat, bright and airy. But, I like some dirt and places to get my hands dirty in, but especially, prefer to be in some shadow where I can hide, rest, and just enjoy the shade; in a word, privacy. In vain did I look. And there's no calendar available either, so no chance on planning "ahead." No opportunities to play tricks or tell little lies either, which are forbidden. I guess believers can live with that. I know I can't. 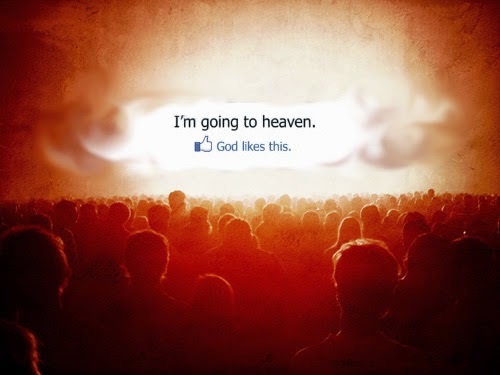 When I think of the Christians I know, they would definitely not be content in Heaven. No suffering to relieve, no grass to cut, people to forgive, no pleasure and relief from making up with after a misunderstanding spat. No deaths of family members and pets to mourn over, no weeping, nor itches to scratch, nor tragedies to share together as fellow humans, globally. As for those believers who hunt, well, forget it; death is not allowed. Nor is gambling, for Heaven is the jackpot that faith and hope had been gambling on, and it's payout time. This is how it goes on, forever and ever, world without end! No more chances that you might lose, ever. I myself couldn't live with that; I live with failure as a way to learn. Guess it's not for Heaven's populace. Think about not being able to get away from those you avoid, ever [...] I'm sociable, but I'm not masochistic. Looking into that "roll call up yonder," I didn't find the names of anyone I knew. On the other hand, I recognized the names of pedophiles and psychopathic murderers. "Why are they here?" I asked. The answer I was given was, "As the Lord hast made predators in the animal kingdom, so hast he created predators in his human creations with such natures, for the glory of God. He hast given them such natures whereby their desires and absence of empathy do not allow them to see anything wrong in their acts. They lived accordingly." In Heaven I found adulterous clergy members, and those who "lied for the Lord" in good or bad faith, who had "repented" and earned the same rewards as the moral, self-sacrificing believers. It was then that I remembered the parable of the grape-picking laborers who showed up at the last hour and got paid the same as those who worked all day, and then I understood. Then, I met my grandparents, uncles, and aunts who had "passed on." Some of them, if I never saw them again, it would be too soon. Think about not being able to get away from those you avoid, ever, and you'll understand. Look, I'm sociable, but I'm not masochistic. Which brings me to another matter: If you're now a masochist for Christ, who enjoys flagellating, starving, and otherwise punishing your body, forget about continuing that practice. Don't even think about it. You've got your rewards for that behavior when you get there. If you even try to continue, you'll offend God, and he'll punish you. And..., if you're expecting to see God at last: Forget it. He's still invisible. That's it. I had just about three hours there before I left. It seemed like an eternity. After that, I made myself a little note: "The less is known, the more is available to imagine and find out the facts about." Now that's living. Contrast that with what believers have told me, "Someday we'll know," about everything we don't know now, when we finally abide in Heaven. Remember: “Be careful what you wish (pray) for; you may get it."